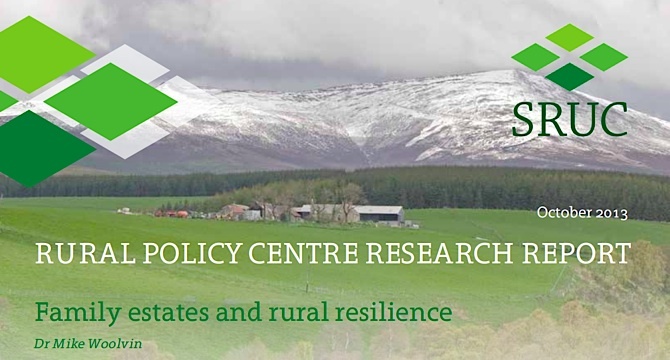 A report was published today by Scotland’s Rural College (SRUC) entitled Family Estates and Rural Resiliance. It contains the findings from a series of 23 interviews with landowners of so-called “family estates”. The report contains a few interesting observations but adds little to our state of knowledge about landownership in Scotland. First of all is the problem of definitions. What is a “family estate”? The report does not say. One presumes it is an estate owned by a whole family but I know of none that meet this definition. The report contains no analysis of whether estates are owned by companies, trusts, individuals or other legal entities. Such structures are important not least because they often constrain precisely who in the “family” is the owner – often this may be a son or grandchildren. But the most important information that is missing is any analysis of gender. Are these estates owned by men or women in the family and what stake do children have? Given the long history of primogeniture and male landowners, this missing gender dimension makes it difficult to understand precisely whose voice is doing the talking and on what basis. Another problem is that the research in so far as it examines the role played by “family estates” in their wider community, only interviews the landowners and not the wider community. It would have been interesting to see whether the opinions of the interviewees are shared by the community with which most of them seem so enthusiastic to embrace. For example (and this is purely anecdotal of course), I received this email today from somebody who is dealing with a well-known “family estate” I guess you might call it. The most obvious problem with this piece of work, however is the sample. The findings are based upon interviews with only 23 landowners. That is a very small sample but there are two more serious flaws. The sample is derived solely from the membership of Scottish Land and Estates (SLE) which immediately biases the sample towards those who choose for whatever reason to join this organisation. The most serious flaw, however, is the fact that Scottish Land and Estates had the final say selecting the 23 owners. SRUC initially selected random estates using codes from an anonymised database provided by SLE. Once selected, the codes were sent to SLE. In the words of the report, SLE “then checked that the ones we had selected were resident family estates. if not, we then re-selected, again from the anonymised database“. This means that SLE had the opportunity of selecting those data subjects which would show “family estates” in the best light. Whether it did or not I cannot say and neither can the researchers – and that is the fundamental flaw in the research design. We cannot therefore trust that the sample is even representative of “family estates” who are members of SLE (a problem exacerbated by SLE who, it appears, used their own unpublished definition of a “family estate”). Moreover, knowing the identity of the subjects means that SLE had the opportunity to speak to them in advance of the research. Whether it did or not I cannot say and neither can the researchers. 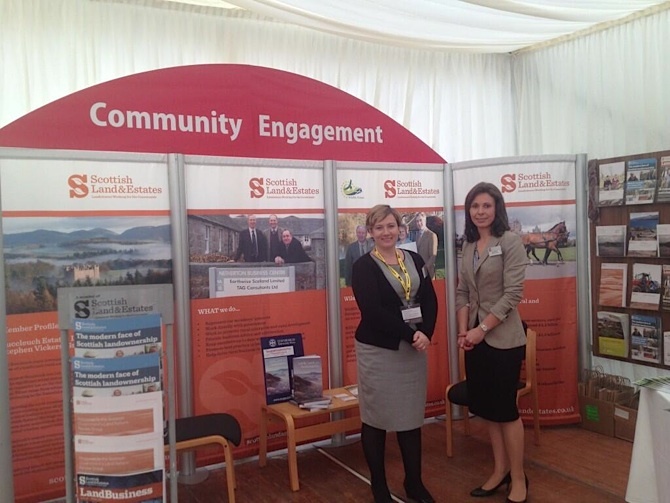 Not surprisingly perhaps, SLE are very happy with the report and are majoring on the theme at their trade stand at the SNP conference where they are launching a “Community Engagement Programme“. In a tweet today, SLE Chief Executive revealed the flawed premise upon which much of their argument rests. I will leave you to spot it. This kind of design flaw has happened before with research undertaken by the Scottish Agricultural College, the predecessor to SRUC. Nine years ago, in a study of nine estates, it was revealed that the subjects were chosen by the sponsor of the research – the Scottish Estates Business Group – my critique of the time is here). The next report will look at the role played by “charity” landowners. I trust that SRUC will adopt a clear definition and it would be very interesting to see whether they include the Applecross Trust and Mount Stuart Trust in their sample. This report is based on a seriously flawed sample methodology and cannot be trusted. It tells us little beyond the opinions of 23 individuals whose authority even to speak on behalf of their “family” is never explained. No attempt is made to validate the views and opinions of the 23 interviewees by seeking the views of others with whom they engage. The research amounts to little more than a series of chats with individuals who have a vested interest in findings that can be presented, interpreted and promoted in a positive light. In the acknowledgements, the author writes, “I would like to thank the 23 interviewees for their time in sharing their views with me“. That about sums up the research. But please don’t take my word for it. Read it and make up your own mind. Without sounding like I’m in any way defending ‘family estates’ I can recognise that some will do anything within the constraints of the legal framework currently in place. Albeit various shades if political party will have created the framework at various times with differing objectives; some to assist such families, some to assist the wider community. The trouble in my opinion no single party is willing or even (perhaps) capable of undertaking sufficiently robust legislation to constrain wayward estates whilst encouraging best practice amongst the decent estate holders. Unless something really radical is done we’re destined to have politicians continue to constantly ‘tinker’ with the succession of outdated laws just simply adding layers to existing laws or creating overlaps or niches where their well-heeled lawyers can advise them to exploit the gasps that appear. Fetch me a bucket please , so i can throw up. Looks like my SRUC subscription is going to be cancelled. Commercial organisations like SRUC follow the money, and with estates getting richer by the day at the expense of their tenants, its no wonder SRUC are running after the lairds. im not going to bother reading the manufactured report. As Andy says it will add nothing to our knowledge of Estates. Ok so its flawed with SLAES hand picked estates, no surprise that they do this, the cocky superior attitude and belief that some people will swallow it. For me the exposure of SLAE and the big Estates tactics have to be understood and well publicised. They push their weight about and use their power to skew all topics. They corrupt and pollute, their disingenuous guff must be recognised by as many of us as possible. Landowners are a great asset to rural communities, the more the better, so let’s have many more of them. ARTB, asap, for the sake of our rural communities. I am always suspicious when the adjective “family” is trotted out. It must be one of the most overworked bits of terminology in our language and really needs to be redefined in a 21st. century setting. It is intended to convey a warm and caring feeling but think of the Sopranoes and the Cosa Nostra and look for our own comparisons! Very much agree Alex. Had the same for years trotted out by NFUS re family farms. Not used so often now the facts became well known that multiple farms and estates were using the cover. Hard working families is the latest condescending political in-phrase. Sadly, it is your attitude towards private estates that is flawed. The facts of the matter are that the SRUC was entirely in charge of the methodology and report content. The research is part of a government funded programme. SRUC liaised with Scottish Land & Estates to identify private, family-run rural estate businesses – to be clear this excluded estates owners such as communities, NGOs and the Church of Scotland. To suggest any impropriety is an unwarranted slur on the integrity of the SRUC and to suggest any ‘tampering’ with the random sample to provide an unrepresentative view is disgraceful and without foundation. Furthermore, the allegation betrays your unwillingness to discuss land-based issues in anything other than a prejudiced or pejorative manner. For you, the results are an inconvenient truth that private estates do engage with the communities of which they are a part, and make a positive contribution to rural Scotland. Of course more can be done, that is why we have today announced a new programme of work to raise awareness of good practice in engagement and partnership working, and provide support for estates looking to increase and improve community engagement. More info on this work, which has been welcomed by the Scottish Government can be found here. I should at least thank you for publishing the photo of Kate, our new Project Manager who will be deluvering our community engagement work, and I at our stand at the SNP conference. I hope it brings in even more visitors. It is a great pity that some people, such as yourself, remain blinded to the realities of the contribution made by estates of all types to Scotland – be they charity, community, private, public and NGO owned. Hardly a resounding endorsement for family estates ! Anyway, if this is all they can take solace in so be it. Scotland is in need of more private ownership, when investment and vibrancy will follow. They’ll be plenty of ground left for the “family” estates after ARTB , won’t there ? I am not suggesting any impropriety, tampering, slurring etc. I merely observe that the research lacks scientific rigour in its definitions and the methodology is flawed and potentially biased. The findings themselves are no real surprise. Do you believe that a national asset such as land should be managed in such a way that it creates the most benefit for the most people? My question is – why was it necessary to have SLE serve as the filter in this respect? Why is such information not openly on the public record? The lack of information about beneficiary ownership means that those of us who read this report are left in the position of having to trust that SLE is an impartial body in the matter. Perhaps SLE could publish its membership database so that we can be assured that this is the case? As it stands, the most that a cautious user of this research can assume is that a group of “family” estates chosen by the estates’ own lobby group, are telling us that they’re a jolly good thing for communities. Well, let us doff our caps in deference to such scholarship. Sarah-Jane also says to Andy, above: “It is a great pity that some people, such as yourself, remain blinded to the realities of the contribution made by estates of all types to Scotland – be they charity, community, private, public and NGO owned.” I don’t think Andy is being blinded to those realities. Those of us who work for an egalitarian and accountable distribution of land in Scotland aren’t objecting to, for example, community land ownership. On the contrary, it’s what we’re trying to advance. A statement like this merely confounds private land ownership with forms of ownership that serve a wider interest. It is smokescreen. My objection is not to communities, public ownership, or most charities or NGOs. Neither is it with private farms worked by the farmer. My objection is to large-scale ownership especially where one party pays the rents, and the other sits back and takes them without democratic accountability. In other words, the objection is to parasitical systems of tenure, and the authoritarian rural relationships that these frequently establish, albeit usually unconsciously so on behalf of those who hold the power. This is sad, not just for those who lack power, but also very often for the powerful. I can think of a number of lairds I know who really try their best as they see it. They put in a lot of effort and money trying to “do things” for their tenants, never realising that what people most want is the freedom to do things for themselves without the paternalistic relationship that “family” estates almost invariably involve. “Parasitical systems of tenure” and “authoritarian rural relationships”. Really? I’ve been practising as a land manager (I know boo hiss) for nearly 20 years and I can honestly say this does not reflect the real world. I cannot see why such a disparaging view of a tenant farming sector which provides the basis for so many successful businesses across Scotland. Farmers who can focus their capital on the business of farming rather than on the acquisition of land. A model used in many other propert sectors to great effect. No ones suggesting its the only approach but it’s a vital part of our agricultural sector. I can’t accept the characterisation of landowners just sitting back and taking the rent. That disregards the responsibilities of the landlord and the many other enterprises and activities also run on estates. The SRUC report provides a snapshot of the sort of activities and relationships Estates have in making a positive contribution across Scotland. Estates aren’t a rural hegemony. They may be owned by one family but often have many stakeholders from tenants, partners to communities etc and work within land use constraints or directives set by a plethora of public policies. They are but one ownership / land management approach amongst an already wide range across Scotland. Yet Estates alone are the target for reform. Notwithstanding this if it is reform you wish I suggest communities or the state acquire land as it comes to the market (tens of thousands of Ha pa) and roll out and monitor the alternatives. Of course this has started, a programme which meets no objection from me. What I do object to is, despite evidence of much positive contribution, is the continual suggestion that Estates should be broken up against the owners wishes. That strikes me as a very authoritarian rural relationship indeed. In fact it could hardly be more authoritarian. While your real world might not be in Alastair’s image of the real world, it does not reflect mine either. I might add that in my opinion rather than tenant farming being a vital part of our agricultural sector, it is vital for that sector, and the individuals and rural communities involved, that we get rid of it. Tom Gray, it might help get beyond the “oh yes it is”, “oh no it’s not” nature of the ARTB argument if you could illustrate your view with some disadvantage you personally have suffered at the hands of your landlord. I think it was the STFA that said recently that the important thing was going to be to feed in personal experience to the forthcoming agric holdings review rather than general statements. Andrew Howard, can you equally give an example of how your estate has helped a farmer to an advantage he/she might not otherwise have had? Andrew Howard, you are living in ‘Factor Fairy Land’ let me explain, lairds and their henchman are very powerful and this is known locally. At our auction mart the Factor pays the odd visit and it always amazes me when people smile and share some small chit chat with this man. THEN when he has gone all the wee groups gather and the tales come out, the truth about how this man upsets and pressurises people dominates the conversations. The real world is FACTORS AND LAIRDS do not see or hear the truth from their tenants(apart from 1 or 2) and thus are a pathetic lot to comment on the mood or needs of rural folk. One example. We have a farm tenant who sold his farm to take on a tenancy on the estate, not because he was in difficulty on the farm he owned, but because the let unit was a larger and more productive unit. They have continued to thrive and have since added other let land from a neighbouring Estate. We have just built a new shed on the farm – in addition to the existing equipment – for an agreed rent adjustment because that gave us a return and the farmer could keep his capital for his business. That do for starters. Pleased to see your colourful turn of phrase hasn’t left you. I’m sorry to disappoint you but as a “factor” that doesn’t define my life. It’s my profession. I’m part of the same community as everyone else. As are the owners I work for. Where people send their children to school is beside the point (local in my case if that helps) – is a doctor any less part of a community if their children are away at school? I’m beginning to wonder if the world you portray is 1913 rather than 2013. Your analysis MAY have had a ring of truth then but its a pretty odd interpretation of everyday rural life now. ARTB is not about my experiences in the hands of my landlord, it is far more important than that. Rather than a cause, landlord/tenant relationships, good, bad or indifferent, are a consequence of far greater iniquity. Sarah Laing, i have just read the report, still don’t understand what it is that’s so important to crow about. Ok so they own a lot of land and property, but what is it about that particular ownership structure that needs to be protected from the Scottish peoples desire for a fairer distribution of land ownership? Yes I saw them at the SNP conference and wondered what they were up to?! I will ask them tomorrow what they think of land reform?! good man Hugh. to assist you, get your hands on the September issue of the “Scottish Field” turn to page 102 and show them the photo of the terrified grouse! read a bit of the text even. It is a national shame, a perfect example of the attitudes of the landed classes. Make sure you show politicians too! Can you tell us how many individuals showed ” lots of interest ” .?? Were these people of the same class as yourself ??. Perhaps a follow up survey would be good, led by Luke Borwick, ideal man for the job because of his prominent position on both SLAE and SRUC. The follow up survey could look at “family Estate integration” and assess how many of the 23 families send their children to the local schools? When the report is completed it could be proof read by someone with fresh knowledge of the plight of tenant farmers, maybe we could get someone who used to be on the LRRG and also understands SRUC? Then to make it slick and slimey get Dougie Mac to inject some adverbs like ‘FAMILY RUN’ or “COMMISSIONED” by the Government even although it isnt. You are right !!! . I could not believe that Luke Borwick of Scottish Land and Estates formerly Scottish Landowners federation is also a director of S r uC . No wonder reports become twisted to support people with their own agenda . Comprehensive school. Would it ???? . Landowners do not integrate into local society . They are square pegs that do not fit in round holes . Flocking together comes to mind . I was also struck by what a formidable staff SLE employs – 19 people in the picture at http://www.scottishlandandestates.co.uk/index.php?option=com_content&view=article&id=67&Itemid=99 and Sarah-Jane’s role explicitly described as “overseeing the policy team and leading on lobbying and representational work.” The honesty is welcome. It’s good to know that it’s paid lobbyists that we’re up against – “we” being people like myself, Andy Wightman or Tom Gray, standing up for the interests of others on our own nearly-always unpaid time. How well paid are SLE’s lobbyists? You have to pay to get the company report and I don’t have my credit card handy (would you email me one for free, please, mail@alastairmcintosh.com), but I was struck to see from the info that’s freely available from Companies House that consistently, there is “no member list” available. That’s interesting. I’m not a company lawyer. I only have 32 year old MBA. It may be that I’m mis-reading what I think the CH info implies, so can I ask you directly as a Director of SLE: do you maintain a Register of SLE Members that is open to public inspection? If not, how does this sit with Section 116 of the Companies Act 2006 that requires you to keep a Register of Members that is open to inspection? Under Section 117 of the Act a company is required to give access to its register within five working days of receipt of a request and under Section 118 an offence in law is committed unless this is complied with, or unless a court order has been granted blocking the request. Can I ask: is your register of members open for such inspection by a member of the public such as myself, or would I require to give you 5 days’ notice to stand and deliver? I am asking this, Andrew and Sarah-Jane, because given that SLE employs at least one professional lobbyist to matters of democratic concern in Scotland those of us on the other side of the debate have a right to know whose interests you are representing. My own interests, incidentally, including all material sources of income, is fully transparent on my website at http://www.alastairmcintosh.com/aft.htm#Table and I think that Andy Wightman does something similar. My objection to these points, which you state fairly and clearly (thank you), is that you frame the small picture but omit the panorama. You represent land as a commodity to be bought, sold and rented out as nothing more than capital. Implicit to your model is an acceptance of a relatively unconstrained capitalist economy in land; indeed, not a micro-entrepreneurial one such as people like me would advocate, but one that is in too many instances (e.g. Buccleuch Estates) effectively monopolistic. You can argue all day long that it is a benign monopoly, and I found His Grace the old Duke of Buccleuch to be a most charming man one day many years ago when 2 SLF henchmen pushed me backwards into the lap of his wheelchair – http://www.alastairmcintosh.com/articles/1998_slf.htm . But at the end of the day, tenant farmers and other tenants on estates, as distinct from proportionate family farms, live their lives not in a manner that is mediated by democracy, but in ways that are mediated by capital (often via land managers such as yourself, a.k.a. “the factor”) and paternalism. What the framing of your argument fails to recognise is that in Scottish culture, as distinct from public school culture, land is far, far more than a capital commodity. Land is Scotland, and Scotland belongs fundamentally to its people, and it is for the people through their democracy who have the right to decide the legal framework within which it can be owned and leased. Your framework permits land to develop a speculative and kudos value that is often away above any agricultural value. That is why people from Russia, Arabia and the south of England want to own land here, so far away from where many of them live. It’s a good bet. But that betting, that extension of the casino economy, is a theft from the people of Scotland. Indeed, any land ownership, including by resident Scottish landowners, that is disproportionate to the wider community’s assessment of its own wellbeing is a theft from the people. Our land, Andrew and Sarah-Jane (and the people you lobby for) is not there primarily for you to manage while protesting that ownership is immaterial. Our land is there for the commonwealth of Scotland, and the purpose of land reform, the thing that drives folks like Andy and myself to put in so much unremunerated time is the passion for justice, and a connected, empowered human ecology, that so many people in this land yearn for, and have yearned for since we were effectively colonised by Normanesque constructs of feudalism going back a thousand years in the east of Scotland, less so in the west, which is why in my view most of the land radicalism comes from the west. So, Andrew and Sarah-Jane, whether paid or voluntary I thank you for at least engaging in this debate. It is something that once upon a time used not to happen. Our Scottish Parliament has helped in that regard. I put to you the question stated above as to whether or not the SLE’s Register of Members is open to inspection, and if not, why not. And I leave you with the question of perspective and framing of the debate. My objection to this recent report on family farms is that it attempts to appropriate the convivial. It “throws out chaff” as military helicopter pilots put it, when they drop aluminium shavings to deflect incoming missiles. It is, in short, a displacement activity from the real debate. But as you’ll know, when an animal engages in what ethologists refer to as “displacement activity” it means an inappropriate activity such as grooming, a whistling in the wind, to deny the reality of that by which it is actually confronted. In this case: justice. You are quite correct that I am a Director of SL&E, a fact which I make no attempt to hide. I am also MD of Moray Estates which I hope clears up, if there were any doubt my interest. I should add, that although clearly I have the interests of the business I run in mind, I contribute because I sincerely believe that the one sided land reform debate which have largely experienced must be more balanced or a great deal of damage could be done to many rural areas and existing successful businesses. Clearly we disagree about that but I am at least grateful for your considered approach rather than the yah boo which characterises some of the exchanges. I will confirm the position with the SL&Es Company Secretary as its not my area of expertise but you may well be correct. How Data Protection cuts across that I know not. In any case I don’t imagine such a register would provide surprises. It’s very clear who’s interests SL&E represent -though that doesn’t divorce them from having a genuinely held view of what can be of benefit for our rural areas. In the same way that other bodies such as NFUS, STFA, STAG, CLS etc have. To the substance of the issue land is if course not simply capital, given its social and cultural importance. However it clearly has a vital function in the production of food, timber and other resources. The allocation of, and management of, land in a way which efficiently delivers these productive requirements whilst balancing socio-cultural needs is key. There isn’t going to be a perfect system, and a number exist in Scotland already, but I find it hard to understand how the model you eloquently outline is going to improve the productive requirements. Indeed estates in providing land for other businesses to farm provide the flexibility and adaptability which many farming businesses require. Andrew – thank you for such a considered and helpful reply. I will look forward to hearing back what the SLE Company Secretary has to say about the Members’ Register – my email address is mail@alastairmcintosh.com. You say: “I find it hard to understand how the model you eloquently outline is going to improve the productive requirements. Indeed estates in providing land for other businesses to farm provide the flexibility and adaptability which many farming businesses require.” My question, of course, concerns the beneficiary ownership of those estates. Is the goodness of Scotland’s land enriching the relatively well-to-do (and super-rich), or is it benefiting the people whose lives paint their meaning in an area? There is a world of difference psychologically and materially, for example, in a wind farm that benefits a local community because they own the land (e.g. Gigha), and one that enriches a private individual. Same with tenant farm rents. A world of difference between the rental going to an individual or a whole community, as with the farms leased on Eigg. Can I commend to you and all readers of this Lesley Riddoch’s latest book, “Blossom: What Scotland Needs to Flourish.” I was one of the people who started the original Isle of Eigg Trust in 1991, but the two factors that made it succeed were, a) the full democratic community taking over of it in 1994, and b) around the same time, Lesley coming on as a Trustee with all her drive and vision. Chapter 5 of Blossom documents that era, including (p. 157) how Michael Forsyth “the strangely biddable Tory Scots Secretary” turned up, and was “rather appalled” with a situation that was “pretty shocking and not sustainable.” More than that, Forsyth’s backing for the community forestry/shop buyout at Laggan around that time was a case where even he saw that community ownership could stimulate the entrepreneurial spirit. So, this is not communism, Hector (below) will be glad to know, but communitarianism. Andrew, try to understand ‘HOPE’ for future generations, hope, to be able to have control of day to day life. Right now with so much of Scotland being owned and controlled by so few we are being denied basic human rights to freedom and happiness. As a Big Estate promoter i doubt you will ever understand that the working rural people of Scotland can deliver, if only we are able to have a greater stake in the governance/ownership of our farms. Hope of course is all aspiring farmings will have post ARTB unless they have the good fortune to be in a position to buy a farm. Could you please explain what control over their day to day activities a farm tenant doesn’t have? Freedom of cropping, diversification rights and the ability to invest in the farm with compensation should you wish are all key parts of the legislative framework. Refinements may be needed but the fundamental conditions are there. Yes, I work for a large estate. But the majority of let farms are owned by small landowners. Should a tenant with a number of farms be able to buy from a landowner with one? I know it helps for you to focus on the “big estates” but its much more complex than that. And for the record I do not promote big estates as the only model but I do believe that many estates deliver a lot that is positive and that should not be rejected against their will. Andrew thanks for continually painting the picture of an incapable rural population if we were to own our own wee bit! You stubbornly refer to legislative crumbs as being the protective framework. THIS is the problem, we have been fed the bare minimum for too long. I would suggest you stick to telling us about big Estates, you cant cover all the ground and pretend to understand 91 act tenants, they will not tell you what they are thinking. As well as a members list, a list of financial contributions would also help unlock who is funding this propaganda machine. I am truly humbled by your words. You have captured the whole essence of our struggle, and I thank you on behalf of myself, my family and my ancestors who have lived and worked the fields I now work, but sadly have no governance over. Yours words will be resounding throughout Scotland, and will help to bring about the justice you and all of us seek. This report actually represents, in a rather poor way, an attempt at something. They now recognise that land owners have to engage with the community. But how?……a group of socially and politically conservative land-owners, for the most part, who know that things are changing, that there is public pressure for change, and, frankly, in many cases, do not have a clue what to do, even those of them who want to. (There are some of the latter.) What I found very interesting, is the apparent lack of any financial and production analysis of “Family estates”. Also data on size, occupancy, that could be used usefully. First of all: The whole land issue is haunted by ghosts. (In some cases literally!). The horror of the clearances, and it’s modern day practice of de-tenanting when leases fall in, or by other methods, is another factor. There is general public suspicion now of all land owners, good and bad. It is politics. But also genuine environmental concern. Also the scandal of the overseas absentee land holders, who acquire land for their asset investment, but do little or nothing, with it, and drive up land prices by their speculation. Their are some millions of acres held for this “Land-banking”, that could be paying useful amounts of tax to the Scottish Government. There are other farmers who are involved in a daily struggle, even on 500-1000 acres of tenanted or owned land, to keep their families heads above water, such is the situation with grazing based farms. The agricultural grant and subsidy system is a mess. It might get better next year. or it might not. The situation with forestry is less than perfect. In the middle of all this, there is the issue of “Family Estates”. That word “Estates”. It covers and conceals a multitude of sins, and some good. To me, a family estate is a family, living by agriculture, or forestry, with or without employees, in a rural area, that makes a living, and lives in the local community. It is NOT some shadowy offshore company in Panama, using cash that might or might not have otherwise been paid as tax, to invest in Land-banking in Scotland. Family farms, I think, fall into the same definition. But I think we need to ask ourselves a simple question: In 20 years, what do we all want to see, for Scotland, in land, farming and forestry?. what should Scotland look like then?……There is NO roadmap. There is an utter ignoring of the future as a way to structure things towards getting to that future. I think this is not deliberate, just lack of vision and professionalism, by the politicians and the Public Civil service who advise them. Because any attempt to change things immediately raises and releases a cloud of angry ghosts from the past. There are some projects, in various areas, like the Government’s various rural programs, and the like. But no big, joined up thinking at all. The old Soviet Union, for all its horrible faults, did believe in plans, five years at a time, and general long term goals, like education, electrification, rural development. These were largely successful, even if the politics were not. I shall probably be called a Communist for suggesting that Scotland needs a Plan. A master plan of where we need to go, over the next 20 years, in five year segments. It has to have general majority support, needs to be understood by the rural population, and they need to feel it is for them, and not for the “Land-bankers”. There is about 14 Billion a year in oil cash waiting, in the event of Independence, so finance is not the issue. Scotland and it’s land is an issue. Some politicians and officials would be panic stricken at this suggestion, as they would then have to propose credible ideas, and a program of rural development and land reform that was fit for purpose. Whatever is going on at the moment, is not fit for purpose, (it has lots of bits missing) and it needs urgent attention. My reason for the above somewhat widely sweeping analysis is that it shows that the report that Andy has drawn attention to is clearly part of the problem, not a solution. It does not analyse the situation accurately, (although it tries to) and if it were a school exam paper, I would give it about 40%. looking on the bright side, it is an attempt to do something. Anything is always better than nothing. The recent land Commission is another example. It laboured, and it brought forth a mouse. But it tried. I could say the same of other efforts. But “Family Estates” are a psmall pat of a larger problem. So all this is pointing towards learning from the past, (Mr Gibson has been here before) and getting a whole series of proper investigations going, into the wide spread of problems with land, farming, forestry, etc, (some have been done, for the rural programs) but doing some joined up thinking. Out of this might come a major legislative and development program, land reform, etc. The SNP Government has responsibility for this. No one else can do it. Scotland is now in “Political Lockdown” for the next year, until 19th September, and nothing can formally be done until after that. But much can be done before, by civic action and civic society. I am concerned that with the referendum coming up, there is no big push to organize, publicise, and propose things. A major opportunity to push for land reform, and rural development, is being wasted. If you do not shout, none will hear you. Time we shouted. Graham – you make a very good point here about the conflation of family farmers, the beautiful, with the ugly. It seems to me that the SLE, representing the range of interests and we can guess where most of their funding might come from, is hiding behind the one to press the rapacious interests of the other. The best solution for this would be for genuine family farmers to withdraw from SLE and find their own representation. In the case of crofting areas, the Scottish Crofting Federation fulfills that role (and as my father was a crofter as well as a doctor, and crofting is in our ancestry, I retain membership of it). The kind of family farmers for whom I have very great respect are not just crofters, but also those with a few hundred acres that you’ll see at farmers’ markets up and down the country – though I acknowledge that you’d not expect to see a cereals farmer selling raw muesli ingredients in Partick on a Saturday morning! But you’ll know what I mean. Real people of real places, and without the pretensions of social class, or the presumption of retention of privilege, that blights the rentier class. I would like to see a Scotland that encourages their stability on the land, including ease of handing down their farms through the family provided they are worked by the family. Leasing out land is acceptable on an interim basis but on a long term basis must raise issues of right to buy, because permanent leasing is about capital and commodification, not farming. An effective voice for small farmers would help shape future policy to such ends. It would lobby, for example, for ceilings on agricultural grants that would favour small farmers and stimulate economic multiplier effects in the rural economy. That is part of the reason why this debate is not just about farmers (and I write from my home in Govan, Glasgow). It is about the social fabric of Scotland, the empowerment and wellbeing of our people and the children. It is about every one of us. If anybody’s at the SNP conference today, make sure the politicians hear that, please. … and can I add, sorry, not just at the SNP conference. When I bumped into Johann Lamont in Govan a few weeks ago it was my pleasure to compliment her on the renewed interest that Scottish Labour are taking in the land question, thanks to Ian Davidson etc. This cuts across most but not all party political lines, and my policy is to give credit wherever it is due. I’m interested in the distinction you and Graham make between family farms and estates. One good, one bad in general terms. As I’m sure you know each comes in various different shapes and forms, each making a different contribution to the delivery of the wide range of public policy objectives. Aside from being a very simplistic distinction it seems to remove the focus from the important thing which is outcomes. A poor quality family farmer may deliver far less than a well run estate. Graham is right that Scotland’s rural areas would certainly benefit from a coherent plan – I believe a land use plan. When Scotland has settled on its objectives for the next 20 years or so then owners and managers of all sorts can be judged on their outputs. If I might make one further observation. I think generalising that estate owners are not “real people of real places…….etc” is grossly unfair to estate owners of all types across Scotland. I accept that some do not live here, neither do others that contribute to Scotland and it doesn’t equate to disinterest, but the vast majority do. Real people in real communities. Personalising in this way may be attractive to the politicians we all seek to influence but the artificial divisions it suggests are not a positive way to conduct a debate. Hi Andrew. In my book, “Soil and Soul”, I discuss this question of the personalisation of the debate set against the imperative of always trying to “go heavy on the issues, but gentle on the people.” I said then, and still find now, that I struggle reconcile this within myself because with private land ownership the issue usually is the people who have chosen to own land, and hold onto it to a disproportionate degree. It is about dominant power, and it is never comfortable to have to name, unmask and engage such power. Rent is a tax on the poor imposed by the rich, and what bothers me even more than the rent is the psychological disempowerment that blights our nation. Lesley Riddoch tackles this brilliant in “Blossom” (Luath Press). Curiously, I have this evening received an email from a good friend who is a landowner by circumstances of birth. I have a number of such friends, not least because many find themselves, as one of them puts it, “choking on the silver spoon.” Such inheritance can stifle their freedom to make and find their own identity because it compromises authentic relationships. When you’re “to the manor born” it can be hard to distinguish the genuine from the sycophantic response, and that wounds the soul, all the moreso when implanted from early childhood. See – http://www.alastairmcintosh.com/articles/2008-boarding-women-landowners-oral-history.pdf . This friend who wrote tonight opens his circular – he doesn’t say how many of us he’s sent it to – remarking that he was surprised to read in the local newspaper that his estate had been one of the positive examples cited in the SRUC report because he had not taken part in any interviews. He then recalled that Sarah Skerratt had asked to take photos for research into family estates while visiting on behalf of the Land Reform Review Group and so, he says, “whilst the photos in the report are indeed of [his estate], the research is not.” [I should add that I received another email tonight saying that at least one of the researchers involved in this report is probably feeling very awkward, having probably not realised what s/he was being drawn into – and so the need not to shoot the messengers but to look behind, to who sent them]. To continue, my landed friend acknowledges the uneasy press reception of the SRUC report and gives links to the various reports. He is clearly a little embarassed by the uninvited association, but he then goes on to say that he’s found the report thought-provoking. It’s making him think more deeply about how to share the benefits of ownership more effectively, and possibly quite radically, with the surrounding community. Woven in to his other questions is the concern that he and his family see themselves very deeply part of the community, and to be fair to him, I would say that such is thoroughly the case. His worry seems to be that while part of him recognises the justice, merits and even perhaps, the inevitability of further land reform in Scotland, it will leave people like him high and dry, without a place in their own place, and that would be an injustice. I entirely understand that very human concern. What I’ll be saying to him is that my view is that power should be transparent, accountable and in an equitable society, shared. He himself, I know, would hold to the view that power should be for service, so his question really is how best to be of service. I will suggest that his place in his place will be enhanced by sharing with the community, perhaps by a management group with local elected representatives. Of course Scottish land reform will be “bloodless” in a literal sense – I trust! It always has been. I know of no case of a laird coming a cropper in the course of conflict over land reform, though evicted tenants are said to have died in the 19th century. I suspect the “blood” to which my friend refers is psychological. I suspect he means the pain of giving up power and a sense of family responsibility, the only cure to which, that I know, is the joy of sharing power. On Eigg, the repeated message to Schellenberg was “just stop lording it over us, and become one of us.” Unfortunately, he couldn’t accept that and it hurt him badly. I feel torn in this debate, Andrew, because I’m very aware that by standing up for the rights of the powerless (and you should see one of the communications I’ve had today form a tenant farmer) I’m aware of hurting the powerful – at least, at the level of their egos. That troubles me. I wouldn’t make a very good politician. The way I handle this within myself is to remind myself that none of us should be here to pander to the egos of the powerful. We should be here to call forth a deeper sense of greatness – a calling back of the soul. I know landowners who have that deeper greatness and who are wrestling to find a better way forward. My example cited above is one of them. In India, a like spirit is what drove the land gift movement. In Scotland, we have recently had the example of the owner of Scalpay, Harris, wishing to gift the land back to the community via the North Harris community owned estate. That man’s name is Fred Taylor, and I’ll tell you, the Scalpay/Harris people will make that man and his descendants forever welcome. His family name will be honoured long after the family money might have run out. They’ll always belong now in a way they never could have done before. It’s beautiful. “The campaign for land reform is driven by ideals: by a desire to curtail the powerful and to empower the disempowered; by a concern for stewardship and community; by a passion for freedom and justice. No one bill is going to deliver on these ideals; and until the ideals are delivered the campaign will continue, if necessary through bill after bill, because we are driven by the most irresistible of all forces: the divine spark of discontent.” (Macleod 1998: 54). Was musing on this over night (can’t be healthy) and one thing I couldn’t get me head round was the practice of how you saw this new era of family farms and crofts working. Firstly what’s a family farm? I know what you mean – one family farming a reasonable area. But farming is not a static business. Good farmers will seek to expand their business and enjoy the fruits of that. Exploitation of land as capital though that is do you intent that the economic trends of the past few hundred years – to less but larger farms- should frustrated? If so how? And has the agriculture industry signed up to this vision? As ever the devil is in the detail. It appears to achieve this you’d need to limit ownership or occupation by area (difficult given variety of land in Scotland) and alter Ag support to favour the small or small ish. I think that has been mentioned. However that is likely to frustrate the development of ambitious and successful farmers preventing them from using economies of scale to make production more efficient. I think there is also a possible risk of reduced total production from agriculture with consequential impacts on the processing and food sectors which add so much to our economy. We act in global food markets which can’t be ignored. Now, I fully understand that this is unlikely to garner your sympathy but reality is reality. We should not therefore hamper our ability to respond to what the world economy and food markets throw at us by creating a system less able to deliver. Before howls of protest from some arrive. I am NOT saying that family farms are inefficient and can’t deliver. I’m saying you need a significant degree of flexibility and freedom to allow those businesses to flex and adapt. They’ve proved remarkably good at that over time already. Many used the let sector to do that. I am also NOT unaware of the social and cultural changes that this make bring to rural areas. We should seek to guide those changes and allow rural areas to adapt to the reality that farming won’t bring the jobs and people it has in the past. You won’t reverse that and keep a properly functioning agriculture. We have a larger farming business but the houses are occupied, other businesses run from the buildings and lots of activity. It’s not the same local society of say 40 years ago, its different but I don’t equate that as less healthy. I too know landlords who would dearly love to be part of the community, moreover, to feel part of the community. They need to feel confident to take the step to give up the grasp of the nettle, it won’t sting anymore! Let it go and feel the relief it brings. Then and only then, will they get their just rewards. They will be part of a thriving, vibrant and just community. Graham, please dont mention the bolshevik/ communists, they were criminals and murderers, nothing else. Alasdair – to clear up the company law point, the members of SLAE in the sense of the landowners who join for it to represent their interests are not the same as the members of the company which is the corporate embodiment of the “club” and disclosure of whom is obligatory under the Companies Acts as you say (provided a formal request is made in compliance with s116 of CA2006). My guess is you’ll find the list of members in the latter sense a bit of a disappointment as being probably just a handful of SLAE office bearers and/or executives and/or their accountants or solicitors etc. I doubt if it’s going to be the roll call of toffs who are the members in the former sense you’ll have been hoping for! An analogy is a golf club. Most GC’s these days have a corporate embodiment (to own the course, employ the green keepers etc.) and that will have a handful of members (in the latter sense) who are likely to be office bearers of the club, its executives etc. But the people who go for a round on a Sunday afternoon are not members in that sense – they’re the members of the club, not of the company which is the club’s corporate embodiment. Hello Neil, and thank you for this clear exposition of a possible explanation. At the same time not all charitable companies limited by guarantee have “no member list” against their name. I suppose it raises, in law, what constitutes “membership” and since SLE are very explicit about having a password-protected member’s area on their website I’m not sure how easy it would be to use the golf club argument. In any case, to invoke any such argument when the accounts (of which I have now been sent a copy) show a membership income of about £1 million a year would beg serious questions about secrecy. SLE would have to choose whether it wished to operate as a secret society, or in an open democracy. After all, I doubt any golf club would make a point of politically lobbying, with a considerable staff, and at the same time insisting on secrecy as to who played on its greens and pay the bills. So, I see the logic of your point, and thank you for it, but I doubt its efficacy. Meanwhile, as you’ll see above Andrew has undertaken to refer the matter to their Company Secretary, and I’ll look forward to hearing what is said. I should say, however, that a land reform campaigner like myself will be expecting transparency. I’d urge that it’s not just the CS’s advice that is considered by SLE in deciding how to respond to this, but also the PR implications should it choose to take a stance that would render it, in a very real way, a secret society. Alastair, my comment was clarifying for you (seeing as you raised it) the technical question of the type of “members” SLAE is legally obliged to disclose under the Companies Acts, not the type of members it may be prudent to disclose ethically, politically, in terms of good PR or any other consideration. I didn’t understand your point about not all charitable companies limited by guarantee (CLBGs) having “no member list” against their name. Not all CLBGs are charities but I’ve e-mailed you directly to clarify in case we’re talking at cross purposes on this. The golf club analogy was about distinctions between different types of member, not about the ethics of transparency. But if its of any comfort to you *every* golf club’s website I looked at (admittedly only five in an unscientific sample consisting of the top five returned on a Google search of “golf club”) had a password protected members’ login area exactly the same as SLAE’s. But as you’ve raised the issue, do you think the Scottish Tenant Farmers’ Association or the Scottish Tenants’ Action Group should be obliged to disclose its members? £1,000,000 a year in membership from the few people who rule the countryside !!!!! No wonder that so few own so much of Scotland . Deep pockets pay for the law in their favour .This is an utter disgrace . 2,500 members to the best of my knowledge. All shapes and sizes and will many interests although a key common one will be the protection of their property rights. Unfashionable at present I know. As to the suggestion that our resources provide some sort of “superversion” of the political agenda in Scotland. Really?! Doesn’t feel like it to me. Can I assume that you have made similar requests of NFUS (we are a member if that gets you off to a start)’ STFA, STAG, CLS etc? I assume transparency requires to be across the spectrum of representative bodies? So that means that landlords have a vote on farm tenancy matters within the N F U S . Do you not think that as being unfair considering that the union was started 100 years ago to help tenant farmers . You could not make this up!!! . I thought that N F U S was meant to look after tenant farmer’s interests – not the landlords !! . The NFU is unfortuneately polluted by landlords who subvert any tenancy reform. Since we are bandying figures about, how much to SLE and other landlords pay to the NFU,? NFUS will need to speak for itself but as I understand it it speaks for farmers. We are farmers and therefore are “polluting” no one in joining all other farmers for representation on matters agricultural. My guess is NFUSs membership reflects the pattern of tenure arrangements across Scotland. Ie 70%+ will be owner occupiers. And for info NFUS has a tenants working group on which landowners have no position. If anything the imbalance is the opposite of that which you state. NFUS policy will be generated by that group and the board on which I’m not aware of any “landowners” in the sense you mean sitting. I’m afraid you’ll need to look elsewhere for a conspiracy! solution is simple, ARTB. the farm that you live and work on which has a 91 act tenancy. This is simply promoting and securing the position of a family farm. The expansion of ownership of this types widens the possibilities for everything. Good landlords have nothing to fear, bad landlords will be bought out, a great way of moving forward. “Good landlords have nothing to fear”. And how do you propose to ensure that? I cannot imagine a tenant not wishing to exercise if they thought it were to their financial advantage – say, buy to sell, buy for long term hope value etc etc. It’s hard to see that tenants will not take the step available to them regardless of the merits or otherwise of their landlord. So lets stop that little myth now shall we. You see ARTB as a treatment for an ailment. Well as a treatment it’s going to be indiscriminate in its application. Lets use an example. A tenant who leases a farm from an owner who owns just that farm. The tenant has a number of holdings including owned – not unusual in our part if the world. A number of our tenants own other holdings for instance. Should he be able to buy? The problem, one of, with ARTB is its characterised as huge estate versus family farming tenant. In most cases its not that clear cut. It’s a recipe for conflict and unintended consequence with those tenants most able to enjoy ARTB being those already most successful and well resourced. If that’s your intention fine – but say so so that those not so well versed with the industry get a more complete picture. Andrew, your over complicating it to bring in the FEAR factor. obviously there will be terms which have to be satisfied, and becoming the owner of more than one farm will not fit the bill with ARTB (land commission/register monitored) Buy to sell? not an issue and you know it MR Howard, you will be well versed on the usual clauses there to stop the ‘quick buck’. Glad to see that you understand the merits of ARTB just a pity that because it threatens the ‘gravy train’ which all land agents feed from you choose to reject it. Cant believe the only thing that you put up against ARTB is that it is complicated. The whole point of ARTB is to get more people living and working in rural Scotland, thus spreading out the wealth accros our nation. To avoid any further confusion perhaps you could set out how you see ARTB working. Who could, who couldn’t, how valued, restrictions on future actions etc. My point is not that ARTB would be complicated rather that because the real world is more complex than commonly suggested that the consequences of ARTB will not be as often proposed. Will you vote for me if I stand? I doubt if GD or any other tenant would vote for you Andrew based on your thoughts above, but the membership of NFUS is such that I know of lots of landowners with the “drawbridge ” mentality who would. SLAE is a master at getting membership on strategic places. Unfortunately we as farmers have to spend almost all of our time working the land, and cannot afford the time nor money to attend meetings. We have no secretary, PR nor spin doctors to work for us. 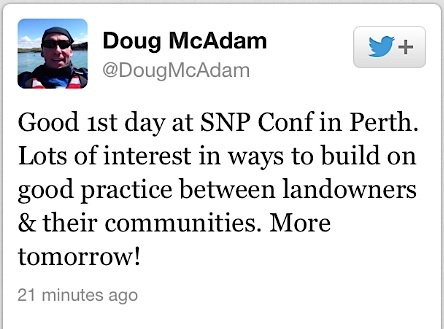 (The poor have no lawyers) So we depend on the likes of NFUS to represent us……..but then ooops ! ……..look who’s in prominent positions within NFUS . just in from feeding the cattle . was there not at least one prominent member of Scottish landowners Federation on the N f U S tenants working group just. several years ago . I am sure they did their very best for the interests of tenant farmers ??? !!!!!!! . Of course I would vote for you if you supported the interests of tenant farmers 100 per cent , but ah hae ma doots . Re the NFUS, when I joined several years ago hoping for assistance with tenancy issues, the NFUS advised us to join the STFA! This sage advice was given once the membership fee had been taken. Gentle Dove, in this instance, the NFUS were unwilling to assist in tenant farming issues. Thank you, Alistair McIntosh for articulating and understanding the tenant farmer’s situation as part of the greater picture in the land reform debate and offering several very interesting avenues regarding Scotland’s future. 1. for 91 act tenancies. 3. implement a 5-10? year payback any excessive profit if re-sold. 4. NO PRE_EMPTION in favour of ex landlord. 5. Farm rents updated, then 20 times the rent. this is fair if that money is reinvested by the ex-landlord it will more than cover the rental value, fortunately for ex-landlord without liabilities. twenty years rent in advance is reasonable because the Lairds claim that farm rental is a business arrangement, so therefore a business solution. anyone coming in fresh, please read Alastair’s comment at 1:12am 20th. It captures the whole situation perfectly. What struck me was the description of how Lairds fear, the unknown position of losing power. And the sadness of paid land agents fighting for their own survival and the continued promotion of Lairds. Thank you. Very clear. As regards valuation I note the rental multiplier approach. Using an example from our area – a 400a farm at a rent of £60a gives a value of £24,000 x 20 = £480,000. The OMV of that farm would be 400a x £5,000a or £2.0m. Even if you have to wait for the ability to capture uplift that seems a long way from an equitable approach to address the marriage of the two interests. £480,000 is pretty good since the landlords investment would have been near zero. With tenants laying the drains, building the buildings and clearing the scrub and rocks, what value has the landlord added? I would also question your OMV figure. The land is not on the open market with vacant possession, it is subject to a tenancy, and the improvements must be deducted. 20 times rent is a good price. I reject your first suggestion. The vast majority of tenanted farms will have been in their current form before the start of the lease. Ie improved land with house, fixed equipment drains etc. the suggestion they’ve been hewn from wild land or something akin is completely erroneous. Yes, tenants have repaired and in many cases added improvements – to which they SHOULD be compensated – but they have taken a commercial tenancy of a farm. Simple as that. As to whether my OMV is correct – it will be for an arable farm in our area. What I did not say was that that was the value of the farm subject to a tenancy. It it’s value the moment the interests are married. If you’re saying that 75% of that value is the tenants in this example then I still fail to see the public interest in ARTB but the private interest is starting to reveal itself quite clearly. We all know that is the greatest instrument of theft ever devised. Just because a farmhouse was built by a tenants grandfather, does that give the landlord the right to claim it? If the same man drained and reclaimed the entire farm at his own expense, should the landlord be allowed to claim the increased value.? People complain about Value Added tax from HMRC at 20%, but the landlords claim value added tax at 100% on the tenants improvements and even extract rent from tenants for them. The Irish land act of 1873 SAID THAT ALL IMPROVEMENTS BELONGED TO THE TENANT UNLESS THE LANDLORD COULD PROVE OTHERWISE. That inspired piece of legislation stopped the lairds gravy train dead in its tracks, and its high time scotland followed suit. Andrew, you are being a little unfair to suggest that the tenant has a private gain financially through ARTB. There are suggested measures to stop any ‘quick buck’. The public interest in ARTB is making our farms more efficient, because family farms are the most efficient, contrary to what the big estates and NFU would like to believe. This equates to a fairer distribution of wealth. With ARTB and in fact a more diverse pattern of ownership, things start to become possible with a greater proportion of our land. A rural community with owner occupier farmers will be stronger, do you agree? The area i live in is entirely tenanted being owned by one man, and the population is dwindling, living under the shadow of feudalism is really unattractive. My point, which seems to have been lost, is that to my knowledge the vast majority of farms as we know them have fixed equipment which was funded by the estate owner. That is certainly the case here. As I acknowledged tenants have added improvements but it is not correct, in my experience, to suggest the tenant or their ancestor created the fixed equipment which is the stolen. From memory, I don’t have the records to hand, our oldest tenancies originated in the 30’s. A number are post war (these were new leases to new occupiers) with the latest starting in the 1970s. The question of pre 1883 improvements ( on which compensation may not be due) has been raised at TFF. Numbers of these cases are thought to be very low. If you have evidence of numbers of farms where tenants provided the original fixed equipment for which they may not be due compensation please send them to either my email address awh@medco.co.uk or raise them with NFUS or STFA and I’m sure TFF will look at the matter. As I say I’ve seen no evidence to-date. You refer to a “redistribution of wealth”. I thought that’s what the tax system is for. The state takes what it deems to be a reasonable share of income or capital and then uses it for the public good. Taking wealth or value from one individual and transferring it to another is a major departure from that principle and one which seems to me to have a weak public interest case. It takes no account of the “wealth” of the loser or the “wealth” of the beneficiary. It also focuses the benefit on a narrow group as opposed to the wider populace and pre-supposes other public interest benefits which seem far from proven. I’m also curious why a tenant is any less a family farmer than an owner occupier? I see very successful examples of either and frankly less successful examples of either. I don’t think it’s tenure driving that. I don’t agree that communities need to be one of owner occupiers to succeed or thrive. For a start in many parts of Scotland the agricultural community is not the dominant section of the community it once was. It will be in some areas I accept but do they really need to own to maintain that. I don’t think so and I’d be interested to see what evidence there is for a farmer owner playing a different community role to a farmer tenant. The tenants working group is a talking shop where good men waste valuable time trying to improve the tenants lot, but nothing ever happens as nothing ever gets past the legal and technical commitee which is fully infiltrated by the landed interest. Fraochy bay, the nfus will take tenants subs quite happily and smile while they stab you in the back. ARTB IS the only option for tenants now, as the rapacious rent demands now being made are ruinous for tenants. Improvement theft continues apace, again leaving only ARTB as a final solution. Degradation of holdings continues as landlords refuse to invest, tenants cannot afford to, and cost saving technologies remain the preserve of owner occupiers. Folks – there is a dread statement at the beginning of Exodus 35: “Ye shall kindle no fire throughout your habitations upon the Sabbath day” – the penalty for the transgression for which is death. Now, my wife says that if I continue on this forum on the Sabbath day, the penalty is likely to be divorce, and I’ve been refraining from further posts mindful too of Rabbi Abraham Heschel’s interpretation of the said verse, which is to the effect that we westerners make the mistake of interpreting these injunctions literally, thereby turning them into objects of ridicule and missing the metaphorical point. The point, he says, is that once a week we should refrain from kindling the fire in our hearts on the Sabbath day – i.e. the fires of strife – or else, metaphorically, we die. So, I’ve called it a day on responding, though I just want to say that Andrew Howard has been extremely sporting (so he’ll be getting my vote), and thanks Slurry Stirrer (above) for drawing attention to my 1:12 am post last night which is buried somewhere up in the entrails further above and contains further psychological/theological reflection. Find it by searching (Ctrl F on a PC) on the word “unmask”. I’m very pressed next week so will be checking out from contributing further to this debate now, but with appreciation to all parties – you too, Neil King! We’ll raise a glass one day. However, before others also start checking out as tends to happen when a thread gets as congested as this one, can I say that what’s here is so rich that I want to keep an archive that is easily searchable, and so will be “printing” this entire debate – nearly 20 pages – to a PDF file. Some of you may want a copy if you don’t have the software or knowhow to do that yourself. If so, email me on mail@alastairmcintosh.com with the header “send copy of debate” and I’ll send you a file – though I’ll wait until the fire in the thread has died down, probably early next week after some of the SLE staff come back from the w/end in Perth, before doing so. Go well. You have still not answered why a leading figure in Scottish landowners Federation was on the n F U S tenants working group . this working group is meant to represent tenant farmers interests . A wee bit of skulduggery , was it ????. I’ve no idea if a SLF member used to be on the NFUS tenants working group. I’m pretty sure there isn’t one now. But what about the SLE member on the legal and technical comitee? Just to ensure no TWG resolution ever goes forward. As to improvements, you may not have evidence of tenants who built houses, steadings and drained farms, but i do, and they will be shown to the coming enquiry on land reform. And why should a pre 1883 improvement not belong to the tenant? Those building are largely still standing ,still in use, and have a very large value today. And why shouldn’t an NFUS member also be an SLE member and contribute to either organisation? You’re presupposing that our agricultural interests will be different. That needn’t be the case. In any case as I understand it the NFUS Board is the ultimate decision making body. Or are their SLE members there as well? I look forward to seeing your evidence in due course – assuming of course it is available. My offer is genuine. If you want the matter looked at by TFF then have it raised even if you don’t want to do it via me. And to repeat I know tenants have carried out improvements -and should be compensated. My challenge is to the assertion that a lot of farms had their original fixed equipment provided by the tenant. This I do not believe to be common. It’s precisely because of this kind of skulduggery that many tenants are turning their backs on certain organisations such as the NFUS . There has also been a call from a tenant’s group to withdraw from the Tenant Farming Forum, that is heavily skewed towards the landowners, rendering them (the TFF) pretty ineffectual. The refreshing thing about the call for ARTB is that it comes from the grass roots, the rural people of Scotland. This will give them the ability to have governance over their own livelihood , investment and business, the very thing that is needed to drive the economics of Scotland’s agricultural sector forward. The TFF members are -STFA, NFUS, SLE, RICS and the Law Society of Scotland. SAAVA have attended whilst preparing the ADR and Rent Review Guidance Document. Young farmers also welcome to attend. SG observe. So how skewed? STFA and NFUS between them must act for almost all tenants. NFUS of course have a wider membership. RICS and Law Society act for all sides in professional capacity. And there’s an independent Chair. Just because one party ( any party) doesn’t get all they want – SLE included- doesn’t mean it’s skewed. I know that we both know where the balance of power lies within the TFF. For goodness sake for many months SLE would arrive with 3 members present, when the norm was only 2 . I used the word “Skewed” as this was a term used to describe the TFF by cross party MSPs during the Land Reform Debate in parliament this summer. My point is that too many so called “tenant ” organisations have been infiltrated by landowners, thus skewing the views of tenants. The TFF being a classic example. Andrew, redistribution of wealth post ARTB, for example on the estate i live on would see around 40 farming families becoming decision makers rather than just ONE man who owns a massive Estate. Energy, ideas, hope, pride can then all be released to their full potential. Please believe me, this is the way I and my fellow tenant farmers feel, this is real. This is hard for you to understand, i know. Please tell us what are the special qualities that massive land owners have that makes the current pattern of land ownership the best way forward? I know that it is your job to protect the status quo, i respect that, but the people of Scotland want a more diverse pattern of ownership, why should we not have that? therefore please defend the Estates by telling us what is unique and special about these land owners? We may have to agree to disagree. Two points though. Surely you are the decision makers on the management of your farm already. Freedom of cropping etc. If this relationship can be improved, where needed, then great – an number of avenues are already part of a TFF workstream. My job is not to defend the status quo as such. There isn’t really any such change as well all respond to the changing environment we have to work in – legislation, tax, CAP etc. I certainly don’t think there can’t be room for improvement in how we all do things. However I believe there are other ways to achieve these gains without breaking to entire Ag Holdings system. Perhaps we leave it at that for now – or at least until Andy gives us something new to muse over. Come on now Andrew . he became a Vice President of Scottish landowners federation at almost the same time as being on T W G of N F U S . you must know !!!!. Has it not ‘dawned ‘ on you ???. No. I’m not playing games. I can find out tomorrow unless you want to save me a job? Tenants who have built their farms from scratch dont want compensation, they want the right to own these investments outright, after all they paid for them. Twenty times the rent will give the landlord a very good compensation . Not fair i hear you say, but how fair have landlords been on compensation in the past? How many millions have been unfairly deducted from waygo claims over the years/centuries? How many buildings with 80 year lifespans were forcibly written down in 15 yrs? How many tenants have had improvements vanish at the stroke of the factors pen? How many lives/health have been ruined by such behaviour? See comments above. As I understand it very few will have “built their farm from scratch”. As for compensation the law as it stands is clear and compensation is due. TFF is looking at the matter to iron out any areas where it isn’t working as intended. That is perfectly addressable. You don’t need to destroy the let sector to achieve that. ARTB isn’t about wanting to sort out compensation it’s about wanting to own. SS is open enough to say so. However I believe the benefits expected to accrue are over stated and the consequential negatives completely ignore – most particularly if you ever want to get on the farming ladder (bit disappointing to see it pulled up in front of you) or if you want to grow your existing business in the most cost effective manner. How many existing tenants enjoyed that benefit (you’re not all third or fourth generation before you say it) and now want that privilege taken away from others. Andrew the ARTB, with more owner occupiers, will give greater options for new guys to get a start. The evidence is there, Andy showed us it on previous. We must realise that anything is possible when you own your farm. Having the decision makers, and lots of them locally, is how we create REAL rugs on the farming ladder. You are almost suggesting that owner occupiers are not capable of passing on their farm, selling a bit, letting it, letting part of it. Why do you not want to promote owner OCCUPATION? What are the negatives of ARTB that you warn us of Andrew? given time i think even the Big Lairds might feel the positivity. It looks like you need to expand your understanding to encompass some uncomfortable truths. Your estate probably has let farms since the thirties which were “equipped” at the time, but who provided that equipment? I would wager it was previous tenants who were forced to donate their improvements to the laird when they were rent racked into bankruptcy in the 1880,s or 1920,s or sometime in between. Most farm buildings/ houses/reclamation /drainageschemes were constructed in the mid to late 1800,s when compensation was zero, and the MINIMUM tenants contribution to such improvements would have been 50% and frequently 100%. Even lets made since the thirties have had substantial uncompensated improvements made due to the one sided law. Once we get the scottish version of the irish land act, and the lairds have to provide the proof of improvement, the real truth will come out. Well your wager would be a poor one in this case. As I said in a post above if there is evidence of improvements not compensatable under the act present the evidence. In any case if a previous tenant contributed (and its quite an assumption that the tenant received no benefit for this) I can’t quite see why the current un related tenant should obtain ARTB on that justification. And why should the landlord continue to enjoy the fruits of a past tenants labour? The justification is quite clear for ARTB even without the arguement over who improved what. ARTB is in the public interest, and the fact that the tenants actually built these farms merely reinforces it. your £35,000 per person P R machine is very slow at finding who the former V P of The Scottish landowners Federation was , who also attended Tenants Working Group meetings to take care of farm tenant’s interests . A bit of subterfuge , was it not ???? . surprised you did not get it ,or maybe not !!. It was your former fellow board member of Scottish Rural Property and Business Association John Don . I think he was meant to represent tenant farmers from the Aberdeen Area on the tenant working group for N f U S but unfortunately once again ah hae ma doots !!. john don then went on to become senior vice -convenor of Scottish Landowners Federation . And he went on to become SLF Convenor – does that make the supposed conspiracy all the more newsworthy. I did ask and awaited the response for the record but as we’re going back a bit and it concerned NFUS not us its perhaps surprising John’s name wasn’t at the forefront of our minds. I wonder at all the secrecy on your part. I hope the 24hrs suspense was worth it! I thought that would have been easy for you . here is an easier question for you . I , like other farm tenants are undergoing a farm rent review . The issue of rents was examined in detail by the Rent Review Working Group last year and their recommendations are being put into place as we speak. Budgets were proposed as a methodology to that group but rejected. See the report as to why but I guess the volatility of using a budget, the scope for dispute over the budget assumptions and the fact that different farmers might be prepared to take a different view of likely trends or how much of the surplus they might wish to share make rental assessment by this means far from the straightforward proposition it was suggested to be. Comparables are a review of what the market will pay -always the best way of valuing something. On that basis tendered rents make the most up to date evidence subject to adjustments (scarcity etc) on the basis that the tenderer will have made an assessment of the worth of the holding. I accept that the current market does not operate perfectly but the collective body of agreed rents provides details of what parties have agreed by negotiation. Lets consider the effect of this. During poorer farming times, late 90’s to 2007 very few if any increases. Real terms rent declines. 2008-11/12 rent increases to reflect improved conditions. In some sectors very improved conditions. Since then any increases have been modest. See recent Lloyds Bank Economic survey data. Under budget system increases in 2008-12 period could have been much higher in some sectors given high returns. Using collective rental market data will smooth the curve. If concerned hire an agent. I realise you may feel its engaging with the dark side but they will have the data to hand and should help get the best deal. And to your specific questions. Yes I do know thank you but no time for games. As for where will we be in 5 yrs. like everyone else we need to collate what info we can and make an informed assessment. That’s business and farming is no different. I thank you for your usual eloquent reply . To cut the chase though , what other businesses use comparables ?? . Commercial property, residential property, in fact most asset classes when setting a rent. None of those markets are perfect in the economic sense but like the market economy it’s the least worst approach. You say that in the poor farming times of 1998 to 2007 there were no increases, but there should have been decreases. The price of grain was back to levels of 1975, when rents were £10/ac, yet landlords expected us to pay £50/ac. Where did this money come from to pay the rent? It came out of capital of course, transferring wealth from the poor to the obscenely wealthy in time honoured scottish fashion. Today, grain prices are exactly the same as in 1995 when labour , fert and deisel were a third of todays value, yet the lairdy robbers expect an increase. What was that saying again? £10 in 1975 worth more than £50 by 2007 so the rent not out of line. Difficult to compare different eras though because of tech change etc etc. If its not worth while why are tender rents and contract farming payments so far ahead of 91 rents? Even after you look at marriage value and scarcity what we see is an activity farmers will pay for – and at levels well beyond most 91 Act rents. If you look at English system which is more explicit about budget input and the rents are broadly the same per farm type. Certainly no evidence of Scottish market being out of line. is there anything you wont twist mr howard? if the rent of £50 was right in 1995 when barley was £140, how could it be right in 1999 when barley was £60? These stupid rents todayare paid by contract farmers who have overspent on shiny toys and are desperate for any ground to help pay their HP payments. Once they grow up, they realise their mistake. As I said in a previous post the current approach smoothes the curve. If you used budgets alone -of course you have to agree how to split the profits – then rents will be more volatile. So 1995 was good for arable so rent on budget may have exceeded £50/a. Under budget it may have fallen back only to go up a lot in 2007/8 when incomes grew a lot. In my view ( and we farm so I see what can be earned) a budget based rent may well have been a lot higher, perhaps north of £100/a using the Moonzie first judgement methodology. As for the contract bidders you do them a disservice. They seem to know well what they are doing and many have been doing it for some years. A bit patronising to suggest they’ll come to their senses in due course. A landlord should not be allowed to increase rents unless he has increased the earning capacity of the farm, eg by providing a new building or drainage scheme. All other rent reviews by dastardly comparables should be banned, and as to that rent review group, that was another lairdy stitchup just like the sruc report. The tenant isn’t responsible for a sustained up turn in commodity prices. Are you suggesting only they should benefit? Are you also suggesting that you think your rent should sit still unless your landlord keeps adding fixed equipment? Despite the effect of inflation and the fact that in all likelihood tendered rents (adjusted) would become increasingly divorced from your own. Hard to know where to begin frankly. If farmings that bad I wonder why you’re so keen to commit further capital to buy the farm. As regards the RRWG which of that body was the “lairdy” infiltrator. If its a stitch up name your man. SLE didn’t pick them. All of TFF and the Cab Sec approved them and their brief came from Scot Gov. So perhaps they just looked at all the evidence, including from tenants, and decided that what you want isn’t a sensible way forward. Farming is only bad because of landlords and the rent rack. Commodity prices may increase, but costs follow right behind and profit is stagnant, therefore rents should not increase. If a tenant invests in the latest combine allowing him to cover twice the ground, why should the landlord get the benefit of that through more rent? We have just had the worst two harvests in at least 50 years, with the worst winter in living memory between them, and the landlord leeches are still wanting more rent !!!!! you are right . Farm rents should have shadowed farm incomes when they fell . but with comparables being used as a constant threat by landlords , farm rents were kept artificially high . it was the farm tenant who had to put up with the pain , paying a rent when there was no profit . Landlords had little sympathy . the comparable system is totally wrong ,and Andrew trying to act as ‘ MYSTIC MEG ‘ has not got a clue how the economics of farming in Scotland will be next year far less for the next five years . yet , to the laird ‘s advantage comparables whether spurious or not , will be used against the tenant to wrack up the rent . This is not how farm rents should be determined . as has happened earlier on this blog Andrew does not know the answers to questions that he should know . or was it selective memory loss ??. it is very naive of us to think that he did not know of john Don and his interests of tenant farming matters . as for commercial and residential property . Well Andrew . The correct answer to that is that they are still building commercial and residential property but ,and this is a big but , they have stopped making farmland many years ago . To even attempt to compare the letting of commercial and residential property to the letting of farmland in Scotland is just plain stupid . Shame on you . You are welcome to disagree with me but please don’t question my honesty -which is in effect what you did. I did not know of John’s role in NFUS – why should I as I wasn’t involved myself. Had I known i would have answered the question. As for my stupidity you make your own mind up. Whether they’re making it or not is beside the point. Rent is a measure of supply and demand. To recognise the impact of scarcity – because supply is limited – that is adjusted out of rents. BUT supply isn’t completely limited is it. 70% of farmland isn’t in the let sector. In theory if it made sense to owners they would move it into the let sector if they thought rents (and I accept other factors) made it make sense. They don’t and one of the factors is that land farmed directly is MUCH more profitable than let out -even before tax benefits etc. That suggests, by one measure, that rents are from from at rack level because if they were you’d expect owners of land to say to he’ll with farming lets let someone else do it. Before the usual uproar I fully appreciate that its more complicated than that in that political and fiscal concerns also have a bearing. In addition farm size and structure will have a major bearing on earning potential. However the suggestion that farmers are being rented out of existence may hold emotional appeal to the political audience this is all aimed at but it isn’t reflected in the behaviour of farmers – tenants and owner occs – across Scotland. Anyway “stupid” from Moray is retiring from this discussion, at least short term, as I suspect we’ve reached the going round in circles point. I think I’ve said before that I realise and appreciate that the history and culture of land is important but so s the world we operate in. It’s not perfect but its the most realistic option. I will contact you by email re the members list. Good debate still continuing, I see. Andrew – you say at one point, “That’s business and farming is no different.” I put it to you that such a perspective is precisely the root of the problem. The argument you are pitching for SLE (I see some are using the more complete acronym, SLAE, interesting) views farming simply as a business and land as a commodity. Real farmers on the ground view it as a way of life – “agri-culture” – the culture of the fields. To view land as a commodity is to break the land. I believe in proportionate property rights – that is to say, the private ownership or secure leasing from the community of property in a manner that is proportionate, or in balance with, the wider welfare of the community as determined by explicit and implicit social contract. The problem with bringing capitalism – control via capital – into it, is it cuts across the culture of the fields. That’s bad for the land and communities. It’s why landlordism should have no place in the future Scotland and we should be like countries that have a matrix of small private and community owned land uses. Andrew, I am dropping briefly back into this debate to ask whether you have heard back from the SLE company secretary yet (as per your above response) about making the SLE Register of Members available for public inspection. I should like to see it under the provisions of the Companies Acts and I am asking you, as a Director of SLE. If you prefer I could send a registered letter instead, since a blog is a rather informal manner of communication, but perhaps you can be the decent type I’m sure you are and save me the hassle, and the stamp? To coin a phrase from a past president of U S A ‘ It ‘ s the economy , stupid ‘. Another quote from an other past president of U S A by the name of Abraham Lincoln was ‘ you can fool some of the people all of the time and all of the people some of the time , but you can ‘t fool all of the people all of the time . Family farms in Scotland are at stake here . If landlords genuinely treated land as a business, they would sell out to the tenants and put the money in the bank. But we all know its a business only when it suits them, a private fiefedom the rest of the time. it’s all right folks , Andrew is just trying to work out what the price of diesel will be for my 5 year farm budget . feed wheat next . Taking a view of inputs and commodities prices is surely what you and other farmers do in making all your business decisions. If you wanted to rent or buy another farm you’d have to do the same thing. Make a projection of your expected income stream, the risks to it and therefore what makes sense to obtain that income stream. So I fail to see why you’re so interested in my view of future prices as if somehow that makes agreeing a new rent impossible. It looks from the outside like you’re arguing that the current system can’t work AND that budgeting wouldn’t work because you have to take a view forward. Anyway as said previously this is going round in circles so to save you asking again I won’t be forecasting the price of Diesel or wheat for you for the next five years though we have done for our own business where we keep a rolling 5 yr cash flow model to we can keep an eye on where we think trends are heading and how it all pulls together. In fact some crops will be sold ahead a year or two to lock in prices where we think that helps. Risk management. So who takes the bigger financial risk ??. is it the landlord or the farm tenant ?????. Gentle dove, landlords and their factors dont do budgets. If they did, they would realise that rents must fall due the collapse in the barley price to 1983 levels and ridiculous cost of deisel , fertiliser and machinery. Every tenant should serve a notice for a reduction. Even Moray estates were quoted in the press bleating at their low yields this year of only 4.9t/ha, so what makes them think anyone else got more? Of course they do although I imagine if you ask 4 people for a budget on a given farm you’ll get 4 different answers. Still missing the point though. Rent is an assessment of what you are prepared to pay to get an expected income return – in its simplest form. So it will always take into account more than whether it rained, or in this case didn’t in Moray this summer. By the way not “bleating” just saying yields were down in spring crops in this area. May be the case elsewhere but I suspect land type etc will have quite a bearing on drought impact. We also lease land in and haven’t asked for a rent reduction based on one years harvest. Why? Because we view things in the round and it also remains very good value for access to that land. Hope the landlords not reading this!! Clearly the tenant. Rent is a cost of occupation just as a mortgage payment would be. Under the system we have rent is not sensitive on an annual basis to farm income but would be to a trend. You could have a rent which was, say on turnover or with a profit based uplift, but as that would involve the landlord taking more risk the rent would take more of your upside in good years in exchange for sharing the pain of downsides. Not an option available for 91 Act tenancies as law stands. Might be worth exploring. Worth noting that in sectors where this is commonly used, eg hotels, the % applied to the turnover is often derived from comparables. Ie by seeing what others in similar circumstances have agreed elsewhere. Ah comparables are used foe hotels too. That will be why half of them are boarded up. What you say about rents may be valid for sldt tenancies, but not for a sitting tenant who has provided most of the fixed equipment . And why not? Even in cases where the tenant has provided some of the fixed equipment you would agree a different % turnover figure – lower obviously to reflect the tenants input. To be clear I am NOT proposing this approach it stemmed from an answer to GD. Having said that worth a look? Perhaps a lesson to take from this is that greater flexibility provides parties with the ability to agree what suits their circumstances. The existing legislation simply channels everyone down the same path regardless of the needs of the parties. Turnover is defineitely not the way. Turnover has increased markedly in recent years, but profit has not, and there is far more money required to run the business and greater risks. I am we’ll aware of that AND as I said above I am not proposing this as a system, though it is used elsewhere, but referred to it in answering another question. As for wheat and diesel I’ve already said I’m not playing games. You, like everyone else, have to take a view on trends. Going 5 yrs out depends on the investment. For rent purposes the cycle is 3 yrs as I’m sure you know. to go back to your comment about landlords farming the land themselves is more profitable . Is this by contract farming rather than in hand ? . surely a prudent tenant during a rental negotiation can reason with the landlord that with the vagaries of the Scottish weather combined with the volatility of inputs as well as outputs that a realistic rent should be agreed rather than a spurious comparable plucked out of the air by the latter . if this does not happen then this will sound the death knell of farm tenancies as we know them .I still need a price for diesel and wheat for next 5 years . any guesses for my 5 year farm budget ???. They are one and the same thing in that the farmer is the farmer. In hand clearly implies your own men and equipment whereas contract will buy in services. As it happens I know tenants who are quite close to contracting out most of their operations. Sensible if it increases their return. Returns from both approaches will well exceed renting out. Largely because returns have been good in recent years in cropping and because scale and marginal benefit (neighbours doing the contracting) cuts costs per acre dramatically. Fixed costs that is. You may not approve but its how many farmers of all tenures improve their returns – by spreading their costs. This needn’t spell the death knell at all. Some owners won’t want the added complication, or risk, some LDT rents are now making them financially attractive to the owner (I know you won’t like that either) and in our case we wish to balance risk. We have a larger farming business already. We understand the vagaries of the market and weather so we are happy to let as well to get a lower return ( and it is) but with less risk. as you probably know , being a practical farming person , the three F s are major inputs in my 5 year farm budget . feed , fertiliser and fuel . all I want are some simple answers . Earlier this year a member of SLE, or perhaps it was his father, perhaps himself a member, told me that I should stop writing all “that rubbish”, as he called it, in ‘the Scotman’ as people would start to believe it. The rubbish referred to was that tenants should gain the right to buy their farms. His preference was that all tenants should be got rid of and land should be contract farmed. Boasting his family contract farmed 10,000 acres, the picture is becoming clearer by every posting. Tenants, often of longstanding, have their rents increased to what land agents call a comparable rent according to what the likes of the above mentioned SLE member is willing to offer. Meanwhile, the landowner spends precisely nothing in efforts to improve the farm. In fact the landowner’s sole expense since he bought over the estate or inherited it, is from time to time hiring such an agent to negotiate a new ‘comparable’ rent, as they like to call them. Not correct. A comparable from a contract farming agreement is not applicable. Following Moonzie it was clarified that LDT evidence was BUT it then requires to be adjusted for scarcity, marriage value (a big influence which is likely to reduce the figure significantly) and the circumstances of the holding – fixed equipment etc. its also not correct to say landlords don’t spend anything. We’ve built two substantial sheds and a silage pit in the last 18mnths not to mention double glazing, wiring and other normal renewals of fixed equipment at the end of its life. If there are cases where landlords are not fulfilling their obligations, and there will be as there are tenants who don’t, then the act provides powers to tenants to deal with that including with holding rent. Things have got significantly worse since 2006, we need the right to buy now before all the tenants and the whole country are ruined by landlord greed. Would that all landlords and agents were as honourable as you obviously are then we would not be having this dialogue. I agree Tom. I think Andrew is defending things that personally I would not find defensible, but at least he is willing to stand up and stand out, and enable a debate that’s very rarely if ever had. He may be doing it as a part of an SLaE strategy of engagement to head off criticism in the face of pressure on landowners, or he may just be doing it out of his own good will. Either way, it aids accountability, and while I’ve not been able to keep abreast of all aspects of this debate it does seem to me that when somebody is not satisfied with his answers, he responds to their criticisms, and that is commendable. If we fail to respect the humanity of our adversaries in debates like this we will become how we imagine them to be. With inimitable eloquence, well said Alastair. Sometimes I wonder why I do it but it isn’t because I’ve been told too. Part of why I do it is to ensure that what often appears like a one sided and somewhat partial view of this subject isn’t the only one shared. I have no doubt that the negative views of the Ag holdings system held by contributors on this blog are sincerely held but they are not the view of everyone and that needs to be understood. If we take the issue of rent and rent review which is the current strand. Simple assertions of landlord greed and strong arm tactics are all very politically appealing, and sadly in a minority of cases may be attempted, BUT, and this is a big BUT, the fact that the setting and review of rents is highly regulated with a clear body of case law for advisors to work with is over looked. So too is the fact that no one as presented evidence of unreasonable rents being set. If you are faced with a rent proposal that you feel is inappropriate, or is based on irrelevant or unadjusted evidence then seek advice and counter that proposal. I do not suggest that, on occasion it won’t be an exercise which creates some anxiety, but with proper advice and a robust case you will be we’ll prepared. It’s worth bearing in mind if ARTB were to be introduced you won’t be negotiating with your bank manager if interest rates go up. That really will be take it or leave it. I tried calling Sarah-Jane but she was in a meeting, and I had an email from her yesterday saying that the Company Secy would be in touch that day. S/he may have tried phoning, but I was out all day, or there may be a letter in the post. I’ll provide an update either here or separately when more emerges. As for the debate on rental, I am struck by the power asymmetry. It is the rentiers who hold all the card. Also, I live in Govan because of my involvement with a local poverty-related issues, and my wife and I are involved with community meals that are provided every Tuesday and Friday. Some of the people come along to these because they are part of the wider projects. Others come simply because they are hungry. They have either not managed their benefits well, or had them stopped for whatever reason. Food prices are of huge sensitivity to such people. The portion of farmers’ production costs that go on paying unearned rent to the lairds is a very direct tax on the poor. That is part of why I see my rural work for land reform, and urban work on poverty, inextricably linked. come on now Andrew , you know and I know full and well that out of 10000 acres there is bound to be a short Limited Duration tenancy stuck in somewhere that can be used as a comparable to use against traditional tenants . this is the real world . give a boy a hammer and everything becomes a nail !!!!!!. your heart is in the right place and I wish you well in what you are trying to achieve . Yes Alastair, UNEARNED RENT is a tax on everyone on the land, and the poor in the cities. The current trend of rack renting tenants till they are forced off the land ensures an increase in general poverty in the locality as jobs are lost and secure affordable homes are lost to commuters who buy or rent them. The classic example was a farm in the borders where the LP tenant was evicted. He employed 12 people on the farm, thanks to some heavy investment by him. Now the farm lies empty, only visited for 3 days at sowing and harvest by contractors, the weeds grow and the tenants forbears spin in their graves. Evicted or did the limited partnership (which probably had a predetermined duration) come to an end. If the latter that was agreed at the outset. That’s not an eviction. Pull the other one andrew. We all know that LP ,s are a sham, and they were never for a fixed period. They had an initial period then year by year.. But that sidesteps the point, which you are adept at, that 12 jobs have been lost in an area that needs them, thanks to out of control landlordism. The average period pre 2003 was 9 or 10 years. LPs provided the fixed term arrangement later provided by LDTs so a little odd they were treated as they were in the 2003 Act creating the difficulties for both parties SG now have to undo. My point remains that the term would have been set in advance. 12 jobs suggests either a very large farm or some other activity on the farm. As I don’t know the context difficult to comment. you dont need to know the context. however it involved growing and marketing farm produce to the consumer. so where do you get your figures from when you approach a traditional farm tenant who has done his farm budget . your proposed rent will probably be based on the S L D T add-on to the 10000 acre farmer ??. See earlier comments. If using SLDT or LDT as a comparable it would have to be adjusted. If the LDT was let to a large farmer the marriage value adjustment would probably be significant. Scarcity and holding circumstances also adjusted. If in doubt seek advice. Contrary to popular opinion land agents are neither expensive nor used to working for landlords only. Our factor forced the comparable of a 364 grazing let which is taken by a big owner occupier. Not fair at all! He then said that on the open market the estate could achieve a 100% increase in rent from the farm if we were not there. The financial drain of this rent heading off to an off shore bank account is something that we can all argue about and moan at. But the real killer is being continually bombarded with negativity and the factor painting the terrible picture of just how less desirable it is to have 91 act tenants, i am always left feeling very low. When you dig your heels in and probe for reasons behind large rent demands, initially you get the answer that the rent collected goes to pay for the running costs of the Estate office and staff. What a crazy system! the farm rents fund the very machine that administers the collection of the rents. If you probe any further, your case is referred to the board, the reply will be “in the best interests of the Estate” bla bla bla. These Estates are actually nothing! this whole system is just a sick game of power. It is incredibly socially unjust. My response to the SAC went in today, how we so badly need change. See comments above on rent setting. The new guide produced by SAAVA should now be on theirs and TFFs website. There is also a practitioners guide available to purchase from SAAVA if you want to be really well equipped. I can’t comment on the estate on which your farm is located as I don’t know the circumstances. Certainly remarks of that nature, taking them at face value, are hardly desirable. However neither would I expect them to be the norm – although I wait patiently for the inevitable correction! Andrew, the circumstances are, that i and my neighbours are made to feel unwelcome. From the comments above and what i see across Scotland the tenanted system is only suitable for providing an ‘add on’ to an already established owner occupier or a person who has employment and takes some ground. A 91 act tenant residing on the one tenanted farm is now facing the types of pressure which make farming life miserable and acutely unattractive too the next generation. Rent setting is a symptom of a disease which needs to be cured! I disagree that the system provides no more than the limited opportunities you describe. We have a number of farms on LDTs which are the only, or main unit. I’ve also recently met a number of new entrants, all in new type tenancies. A capable and motivated bunch grabbing their opportunity with both hands. If your experience is poor that is regrettable. But surely better to address that than throw the entire system away. Important to note that ARTB is not “throwing the entire system away”. Those, such as the tenants you describe, who are content with existing system, will one presumes choose not to exercise such a right. Others, such as SS, may well do. That’s the same choice that is provided to crofting tenants and leaseholders in England and Wales. It is only long leaseholders in Scotland under Long Leases Act who are being forced to convert to ownership whether they like it or not. PS this thread has gone well off topic but that’s fine – it’s what happens (though I dont tolerate it early on). For everyone’s information, comments automatically close after 2 weeks. The can be re-opened but I can’t run a blog with no time limits. The good landlords having nothing to fear argument seems to me weak. If a tenant has a right and they see advantage to them in exercising it ( expected capital gain, future development value etc) they will do so. I wouldn’t blame them but doesn’t seem to me tenable that only bad landlords would suffer. yes Andrew, that is exactly my point, LDTs and new style tenancies, people who have entered a contract on those terms. Its the 91 act tenants that are now being forced out, yes forced out! i would love to tell the stories on here and tell everyone the Estates involved, but im not going to. In order for Richard Lochhead to move forward with a review of Ag Holdings, we need to allow 91 act tenants the opportunity to evolve into owner occupiers. Then we can get things fairer and move forward with the rest of our tenanted sector, NOT ‘throw the entire system away’ as you colourfully suggest to try and create confusion on the subject of tenancy type and ARTB. Fair point on the bank manager, Andrew, but that is why ARTB needs to be based on agricultural and not market value – like the 15 x rental that I think is still the case for buying out a croft leasehold. My favoured approach is LVT – both to use the proceeds to finance community buyouts and to crash this corrupt speculative value held by land. You cannot fairly move away from the market value subject of course to the tenancy. 15 times rent would allow most tenants to buy at something like 25% of its value after exercise of ARTB. Owners don’t set the value of land but its worth what its worth. If you want to transfer wealth you use the tax system to transfer it to the state who then make use of it for the public good. You don’t transfer direct from one individual to another. Thats personal interest not public interest. The potential personal benefit of ARTB is the unspoken subtext to this debate. Well since tenants created the bulk of that value, 25 % seems a fair return to the landlord. Why should landlords get a fair deal when they are far from fair themselves? Once the landed estates have been extinguished, we can all get on with the business of agriculture on a proper business footing, without fear or favour. I do not believe you can arbitrarily pick a price and say that’s fair. The property has its value, subject to the tenancy etc, and that is its value. If the tenant has improved it that is reflected in the valuation – ie reducing the landlords interest. In short he can’t sell a shed he doesn’t own. If you don’t attempt to deliver a fair value based on the property’s value then the courts will be busy, the tax payer will end up with a big compensation bill and yet the tenant will have made a big personal gain. Private interest yes, not public interest. I think you are nearly right. It would be equally correct to state that the loss of personal benefit by ARTB is the unspoken subtext to this debate. However, endless point scoring on the formalities, legalities and technicalities of tenancy arrangements is, frankly, a worthless bore. The potential benefit to the wider community of ARTB, or any other development arising from developments concerning family estates are issues about which this blog, considering its starting point, might usefully focus. Agreed, but the farm is owned by its owner and you cannot forceably (in principle my view is that you should not anyway) transfer that at anything other than its proper value subject to the tenancy. Make the case for public benefit of ARTB / Land distribution if you wish that is your right but while your at it consider the jobs and enterprises at risk from that distribution and detail the private gain of the people who would exercise ARTB. You could start with your own farm at 15 times rent. What’s it worth the day after. Might illustrate the point. I’m sorry the technical points are a bore. It’s not my idea of a pastime either but they’re important. People are making swingeing assertions about the failures of the system whilst conveniently ignoring that the law already addresses many of them. It is important that outside observers of this issue, many in Holyrood who will decide on this, make decisions based on a full understanding of a complex area and not emotionally charged assertions from some for whom the system is not functioning properly. I realise your point is wider, that you don’t want the system at all. Well that’s OK if you have the luxury of a tenancy already but I doubt it will find much common cause with an aspiring farmer. The technical points are a bore because they are, or should be irrelevant. Like discussing what colour to paint the bathroom in a house that’s long overdue for demolition. With land being a finite resource, land reform is about moving toward use of land to best sustainable advantage of those on the planet, man, beast or otherwise. To this end, use and ownership are inseperable. The current landownership pattern in Scotland is like a paint-curling damp bathroom wall. A tenancy being a luxury is interesting as it poses the question, where do you suppose that places land ownership, the power to select tenants, or indeed the choice whether to have them or not? Do you really think the best we can do is have archives of litigation binding a minority owning all the land and the majority fighting among themselves for the luxury of the tenancy of a portion of it? Yes there is no such thing as a good landlord, to aspiring farmer or otherwise. We need to lock the archive door, enter and think in the real world beyond. Eloquent and I follow your line of thought – I think. But having locked the door on the archive you will be personally a lot better off and whomever owns your farm a lot worse off. Correct? My point is that is what up you have a tax system for. Andrew, Dont throw in that aspiring farmer nonsense. Aspiring farmers are not going to get a 91 act tenancy, so they are nothing to do with this. They will get LDT or SLDT,s, so are separate from ARTB. Could you please outline on this blog in detail the formula you use for adjusting a short limited duration tenancy against a traditional tenancy where the S L D T tenancy is the bolt-on . Take it that hypothetically both tenanted areas of land are very very similar to keep it simple . Andrew, I remember an Irish farmer saying to me, “There’s no such thing as a good landlord.” It felt a bit sweeping at the time, but once you strip away the myth that landlordism is a service that “provides the land”, and you start asking why it shouldn’t be the surrounding community that provides the land, with the benefits coming to that community (as with many French communes), and the farmer or forester being an integral part of that community, equally involved in its decision making, then you start to see what a paternalistic and disempowering system we have here. I remember one of the tenant farmer families under Shellenberg on Eigg. They said that for them (and this was in their personal perception of the matter) the life-changing realisation was that they’d unconsciously, since they were young, remained in a relatively child-like state of benign dependency, but that it had stopped them from growing up and being able to become fully responsible. Another island woman on Eigg said in a BBC debate to Schelly, “We’ve never had a chance to show that we can be responsible.” That’s why to a land reformer like myself this is primarily not about economics, but about community empowerment and a different socio-political structure than the one we have now. I would like to see a patchwork of working owner-occupied farms and tenancies held by community groups. I would like to see people freed from the often-dysfunctional family dynamics of the Big House. “There’s no such thing as a good landowner.” What can you do if you are one? Consider relinquishing your power, like with the Indian land gift movement, and coming into balance with the rest of the community, and then you will truly belong. You’re vision is certainly grand but I cannot see but that structure is anything other than a minority position in any part of Europe at present. If you wish to expand that model of community ownership what is to stop communities buying when land is sold? The government could fund or support if they thought that in the public interest. A surprising amount of land is sold each year so progress would be made. Yes, some land remains un sold for generations but it you seek to force sale then in practical terms the problem is funding that. Or are you suggesting existing owners give it away!? I don’t think that will get a high take up. I’m also interested to know if the community ownership structure is demonstrably a more efficient delivery model for the panoply of public policy objectives, many of which are economic – accepting that they overlap with the social. I seethe success of community ownership already in Scotland but there is no denying the huge support provided (that is not a criticism) which is clearly having an impact but may not be repeatable right across Scotland. Perhaps we should focus less on ownership and more on community engagement and participation in local land use decisions in a much more meaningful way than the current planning system provides. Introducing community plans at the base layer of the LDP system, prepared by communities – which of course includes people who own land, farm it etc- should improve the sense of influence over what happens in their community and improve dialogue and engagement with landowners who will have to participate if they want to influence output. Cheaper than buying land and spreads the benefits across all communities not just the few who get to own. Anyway, a thought! Why do you seethe the success of community ownership ????. Could you also try and answer my questions ?. Sorry, see the not seethe. Forgot the space! And you were perhaps too quick to assume I had a beef with community ownership? To your earlier question. Say the rent on a farm is £60/a. It’s being reviewed. A nearby farm was tendered on an LDT. The bids from neighbours come in at say £150/a. The bids from stand alone aspiring farmers in the £75 to £90 range. My view is the difference between £75/90 is largely marriage value to be discounted. NB there are some circumstances where the marriage value is not to be discounted but usually is so let’s go with that here. The question then is how much of the gap between £60 and 75/90 is scarcity. You’d look at range of bids and then other sitting tenant agreed rents to assess how much premium you think may have been paid. Some no doubt, but probably not excessive for a 10 yr LDT because you have to make it back. The figures are from this area and are based on real figures. The rent stayed largely the same based on the bulk of evidence of sitting tenant reviews. You should not draw conclusions about set % deductions for marriage value or scarcity although that approach was used particularly in setting fair rents for houses under regulated tenancies. Oh yes, fair rents and regulated tenancies, its time they came back too!!!! The only problem was there weren’t any houses in the private rented sector because it wasn’t attractive to the owner. 1989 saw deregulation and a huge increase in supply and quality. Yes and a seven fold rise in rent in 20 years when wages have only doubled. People are sick of high rents and no security of tenure. The landlords seem to be desperate to prevent ARTB as they think tenants are getting something for nothing. They have never been averse to taking something for nothing themselves, and ARTB is really just returning stolen property. If ARTB goes ahead at 20 times the rent, it should be subject to controls that it cant be sold on for 20 years without penalty. if you are the 4 th generation tenant of 400 acres and your neighbour farmed 10000 acres and took on the L D Tenancy at £150 / acre you would be in a sticky wicket . mr Big next door to you can spread his costs over a far bigger acreage . that , I am afraid , would be to your disadvantage when it comes to a rent review . hence one of the main reasons why comparables are not a fair way to settle a farm rent . you can say whatever you want about this and that being taken into account but the comparable will be used like a sledgehammer on neighbouring tenants . this is wrong . GD, The man of straw neighbour who offers a daft rent just to get in has been the bane of scottish people for centuries. Thats why scots intrinsically dislike go ahead people, because they know the factor will use them to rackrent everybody else, and the benefits of any new methods will ultimately all acrue to the landlord, leaving them working harder for less money in the end. In landlord -free countries you will find go ahead people are looked up to, away from the dread influence of factors. Very interesting point there, Hector. Hadn’t thought of that one. And thanks for your response Andrew but I’ll not come back on it except to say “LVT” as distinct from income taxation – just sitting stranded at Preston station on way back north on the dread W. coast line, and a bit worn out. just heard very disturbing news about comparable farm rents . how it works in the landlord’s favour is this . mr Big with 10000 acres offers £90/ acre for new add on L D t . laird says he will get the tenancy if he agrees to say that the rent is £150/ acre so that it can be used as a comparable against other farm tenants. this underhand scheme is what is termed a ‘ discounted ‘ rent in laird circles . Have you ever heard of such mal practice . in your position , you have bound to have . back to Mystic Meg on farm rent reviews ???? . Genuinely never heard of it. In any case if an add on unit still have to account for marriage value, scarcity etc. It in doubt seek advice. If believe malpractice then refer to RICS. They will be interested. RICS members have to adhere to professional standards and they do have teeth – fines, kicked out etc. thought you would say something like that . what penalties have ever been administered over say the last 20 years and for what reason ?. anyway , getting back to the original theme of the report on Family Estates and Rural Resilience . I have just been checking out the evidence given to the Land Reform Review Group and there are some beauties ? how do you account for j D A Williamson of Alvie and Dalraddy estates writing ” that the decline in our country started when those who own it ceased to run it ‘ ‘. if ever there was arrogance , this is it . i am sure this comment is shared by other Estate owners in Scotland , Estates in Scotland want to turn the clock back to when they were in total control of the country . That would be true if ARTB were being proposed as a sanction against bad landlords. But it’s not. It will be a right to *all* secure tenants, irrespective of how good or bad their landlord is. Paradoxically, it’s good landlords who have the most to lose because they are most likely to have to have “good” tenants. These will be shrewd businessmen who exploit the opportunity that exercising the right to buy on even the most average of family farms could net them a quarter of a million pounds overnight. So whatever the rights and wrongs of ARTB may be, can we please clear the decks of the “good landlords have nothing to fear” myth. I am *NOT* peddling the “falsehood” that “good landlords have nothing to fear from ARTB”. So will you go on the record here and agree that “good landlords have nothing to fear from ARTB” is not true? From which folk will inevitably infer that you believe that good landlords have nothing to fear from ARTB. You are mistaken. Intelligent folk will infer no such thing.